Howdy! 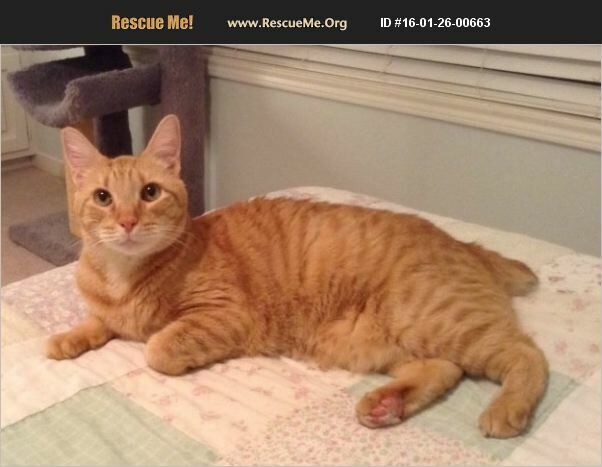 My name is Sam, and I am a sweet, laid-back lap kitty extraordinaire who is a Manx/ orange tabby DSH mix. Ginger tabbies are renowned for their outgoing, friendly personalities, and I'm no exception! I love to investigate with my stubby Manx tail straight up in the air like a whitetail deer. I'm so cute to watch as I twitch my stub when I'm reclining or walking around. My favorite spot is in my foster mom's lap, and I try to spend as much time as I can right there. I show my contentment by turning on my purr motor, which sounds like a perking coffeepot. When she's sitting at her desk, I'm content to supervise the typing; I just want to be close enough to her so that I get a few head scratches and that my purring is audible! I also enjoy sleeping with her, playing with my catnip toys, and patrolling for tree roaches that creep inside. In my calm, mild-mannered way, I have done great around the other cats as well as a small dog in my foster home. Although my first as well as my foster homes have been quiet and peaceful empty nests, I do great when my foster grandsons come to visit -- as long as they don't make a lot of noise. In fact, I even let them sleep on the sofa with me and use my body as a pillow! I was born in 2010 and am in great health: my recent pre-dental blood work fell within all the healthy parameters. I was adopted as a kitten, but my owner had to surrender me due to her breathing problems with COPD. Now all that I need is a lifetime family to chill out with me and allow me to steal their hearts. Won't you be the one whose blood pressure is lowered by my loving companionship? Sam is updated on shots, neutered, dewormed, microchipped, FIV/ FeLV negative, and ready for his indoor-only home. No declawing permitted. His adoption fee is $100, cash or check payable to Buster's Friends. Please click the contact button if you are interested in Big Sam, and we can let you know exactly where you can meet him. To make the process more efficient, download the adoption application at http://www.bustersfriends.org/catadoptionapplication.shtml. First save and then open it; then you can print it and fill it out.